From the least expensive Chevy to a pricey BMW, the newest autos pack a great variety of technologies that can make road trips (or the drive to school) a lot more enjoyable—and perhaps safer and more productive as well. But with automakers increasingly using technology to distinguish their vehicles from the competition's, the selection can easily overwhelm even the most dedicated car shopper. So, to save you the trouble of visiting too many dealer lots, we recently went exploring for some of the most compelling car tech for families offered in model-year 2013 and 2014 vehicles. Here's what caught our attention. The entry-level 2013 Chevrolet Spark and Chevrolet Sonic are aimed at young adult drivers around the world who grew up with the Web. So Chevy is equipping the higher-end versions of these cars with a standard in-dash "infotainment" system named MyLink that rivals the systems found in more expensive cars. It features a seven-inch color touchscreen that provides access to audio stored on smartphones connected to the system via Bluetooth or a USB cable––and in particular to audio provided by two streaming smartphone apps: Pandora and Stitcher. In addition, MyLink can be used to stream movies and photo slideshows to the in-dash display from the smartphone when a USB connection is used (video is only available when the vehicle is parked). And beginning in the first quarter of 2013, Chevy will integrate the TuneIn streaming radio app into MyLink, enabling drivers and passengers to listen to local radio stations from around the world in the car. MyLink works with iPhone, Android, BlackBerry and Windows Mobile smartphones, as well as with Nokia smartphones running the Symbian operating system. This spring, the "next-generation MyLink" system that will debut in the family-oriented 2014 Chevrolet Impala will integrate Pandora, too, though not Stitcher or TuneIn. But its hallmark will be a greater level of personalization to accommodate all the drivers in a family. With an optional 8-inch touch-sensitive display in the dashboard, each driver can set up the system to use any one of four graphic "personalities" or appearances for the control interface as well as set his or her own 60 "favorites" for quick access. These can include radio stations (AM/FM/Sirius), phone contacts, navigation system destinations and smartphone-based music (songs, albums, genres and artists). The larger display also adds the ability to control the next-generation MyLink system with finger swipes and other gestures. For example, you can swipe through lists or drag and drop favorites icons, like with a smartphone. Chevy plans to continue offering different versions of the MyLink system in its various models, tailoring them to the different target customers for each vehicle, a spokesman tells Techlicious. Ford, this spring, will outfit higher-end versions of its all-new entry-level 2014 Fiesta with an updated "SYNC with MyFord Touch" infotainment system, a first for this car model. 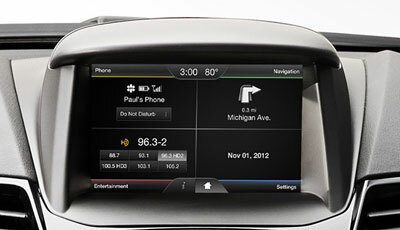 The system includes a 6.5-inch color touch-sensitive display in the dashboard and updates to Ford's SYNC software. These update bring easier Bluetooth pairing, more natural voice recognition with better accuracy, a simplified voice command structure and easier navigation system controls. 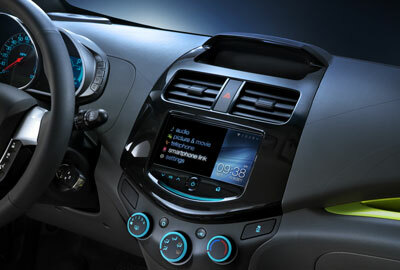 Lower-priced versions of the 2014 Fiesta will be equipped with a 4.2-inch color display and SYNC AppLink, which enables on-screen or voice-activated control of a wide variety of streaming audio apps on connected compatible smartphones––including the streaming music apps Pandora, Stitcher, Slacker and MOG, Web radio apps TuneIn, iHeart Radio and NPR News, and sports apps MLB.com and At Bat. SYNC AppLink's app compatibility varies by smartphone. Also new to the Fiesta in the 2014 model-year will be HD Radio and an eight-speaker Sony audio system. Land Rover's all-new range-topping 2013 Range Rover offers standard and optional sound systems developed by the British high-end audio marque Meridian. 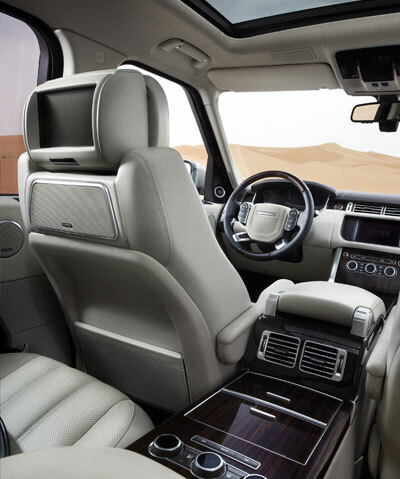 Standard on all but the most expensive Range Rover is a 380-watt system with 12 speakers plus a subwoofer, 10-disc virtual CD changer, single CD player and AM/FM stereo tuner. Standard on the most expensive Ranger Rover Supercharged Autobiography and an $1,850 option on other models, is an 825-watt system that includes 18 speakers plus a subwoofer, a 10-disc virtual CD changer, a single CD player and an AM/FM stereo tuner. Optional for the Ranger Rover Supercharged Autobiography is a 1,700-watt system that costs $4,450 and comes with 28 speakers, including four roof-level cabin speakers that produce 3D surround-sound, as well as a subwoofer, a 10-disc virtual CD changer, a single CD player and an AM/FM stereo tuner. Additionally, to take advantage of the 3D surround-sound capability, the Supercharged Autobiography comes standard with a rear-seat entertainment system (which also includes a pair of wireless headphones). HD Radio, Sirius satellite radio, Bluetooth audio streaming, a USB port and iPod integration are built into all Range Rovers. BMW 5 Series and 7 Series cars with navigation systems can be paired with a rear-seat entertainment system that brings new meaning to the term back-seat driver. Using the 9.2-inch displays built into the front-seat headrests, each rear-seat passenger gets individual access to nearly the full set of navigation system functions, including their own views of the navigation map and separate abilities to do a point-of-interest search or specify an address for a destination. Back-seat picks can be sent forward to the in-dash screen as a "recommendation" to be accepted or rejected by the driver or front-seat passenger. Those in front retain ultimate control of the navigation system, however; they're always able to disable rear-seat navigation system access, and rear-seat passengers can't ever set a destination themselves. With the optional BMW Assist Convenience Plan ($199 per year), the rear-seat entertainment system can also be used to access a suite of BMW Online apps, including Google Street View and Panoramio for photos of destinations, Google Local Search, Yelp and Wiki Local for local business recommendations, plus local weather forecasts and fuel prices at nearby gas stations. The system also allows each rear-seat passenger to choose and control a different audio source, such as audio streamed from a USB-connected digital audio player or a satellite radio channel. Sometimes a family vehicle is a pickup truck or a sports car. For these instances respectively, Chrysler is offering in its revamped 2013 RAM 1500 and 2013 SRT Viper a unique communications option: the Uconnect Access telematics system with on-demand Wi-Fi. Utilizing an on-board 3G cellular modem powered by Sprint and an on-board router that can pair with up to six devices, users may create a temporary mobile hotspot in the vehicle and purchase short-term Wi-Fi access to the Internet––daily ($14.99), weekly ($29.99) or monthly ($49.99). There are other features that come with Uconnect Access, too, and all of those are available free of charge for now, during a trial period that is expected to last at least six months. Pricing for the Uconnect Access system as a whole––separate from the on-demand Wi-Fi service––will be set at a later date, Chrysler says. The RAM 1500 has been at dealerships since October. The SRT Viper arrives early this year. Other Chrysler vehicles will offer Uconnect Access this year, as well, a spokesman tells Techlicious. Which vehicles and the timing were not disclosed. Audi was the first automaker worldwide to offer factory-installed wireless Internet access in its vehicles with the "Audi connect" telematics system, introduced in 2011. It can create a Wi-Fi hotspot for up to eight devices and connect them to the Internet at 3G speeds via T-Mobile service, which costs about $30 per month ($324 for a one-year contract or $600 for a two-year contract) after a six-month free trial period. The system is optional or standard on Audi A4, A5, A6, A7, A8, Q5, Q7 and S models. Audi connect also includes access to online services and apps, including Google Earth, on-screen or voice-powered Google Local Search to enhance navigation, and news, weather and local fuel price information. For 2013, Audi is adding Google Street View, which engages as the programmed destination is approached and provides a view of this location as it would actually be seen from the direction the car is traveling. To spur safer driving by teens piloting the 2014 Fiesta, Ford will also be offering its MyKey technology with that model for the first time. MyKey is a car key that can be programmed by parents so that, when it's used, the car will not go above a pre-set speed limit (selectable up to 80 mph), the audio system will not play louder than a pre-set volume limit (to a maximum of 45 percent of the system's capability), and will continuously play the car's "Beltminder" warning chime and keep the audio system muted until everyone in the car has buckled his or her safety belt. In addition, when MyKey is used to start the car, safety systems like traction control can not be user-deactivated, and the low fuel warning light will illuminate sooner than usual (at 75 miles to empty instead of 50 miles to empty). Mercedes-Benz, meanwhile, is planning to make its flagship 2014 S-Class sedan even safer with a system that takes over steering the car to help it automatically stay on course. 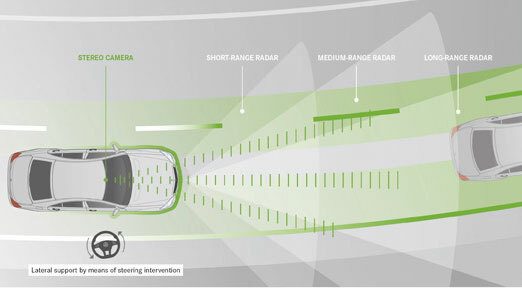 Called DISTRONIC PLUS with Steering Assist, it is an augmented adaptive cruise control system that employs a forward-facing stereoscopic camera behind the windshield to detect both lane markings and the trajectory of a vehicle ahead, and then generates steering wheel torque to either keep the S-Class going straight or direct it through slight curves. It will work at all speeds up to a maximum of 124 miles per hour. However, Mercedes purposely stopped short of designing a system that would permit the driver to abandon all control of the steering. Sensors determine whether the driver has taken his or hands off the steering wheel and, if so, the steering assist function is deactivated and a visual warning is displayed in the instrument cluster behind the steering wheel. The 2014 S-Class will arrive at dealerships in the second half of next year. I read that the Spark will let you stream movies but you can only watch when the car thinks you’re not driving. Someone will figure out how to bypass that and let it be available to everyone else. One area we think is coming, and will be very popular is interactive audio entertainment. We’re developing a platform for this content, everything from trivia to interactive fiction. It’s all no visual load and optimized cognitive load. Meaning it’s actually _designed_ for the car. Check us out in the App Store!